Whoever feeds on my flesh and drinks my blood has eternal life, and I will raise him up on the last day. For my flesh is true food, and my blood is true drink. Whoever feeds on my flesh and drinks my blood abides in me, and I in him. The Apostle Paul describes the Eucharistic meal as a koinonia (1 Cor. 10:16).The Greek word, koinonia, has a great depth of meaning: sharing, partaking, fellowship, communing, and unifying participation in the life of God. When we drink the Blood and eat the Body of our Lord Jesus Christ: we commune with Christ, we share in his resurrection, we partake of his grace, we fellowship with God and his saints, and we are brought into union with his heart and will. In short, we become partakers—people who share in the very life and love of God. Whenever we participate in the Lord’s Supper, we experience Christ’s Eucharistic love. This God adored by multitudes of angels comes to me as love, the redeeming One, the eucharistic One to give me everything, to fulfill me abundantly. 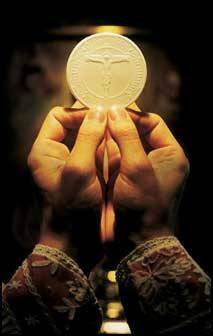 To delight me with himself so that even I, so much immersed in this world, do not want anything else, but only His eucharistic love. Tadeusz Dajczer, The Mystery of Faith: Meditations on the Eucharist (Brewster, MA: Paraclete Press, 2009), 10. This entry was posted in Holy Eucharist, Roman Catholic Church and tagged Holy Eucharist, Roman Catholic on February 2, 2013 by GlennDavis.